Another day of rioting expected on Friday in Judea, Samaria and Gaza, as Arabs protest U.S. and Israeli policy. 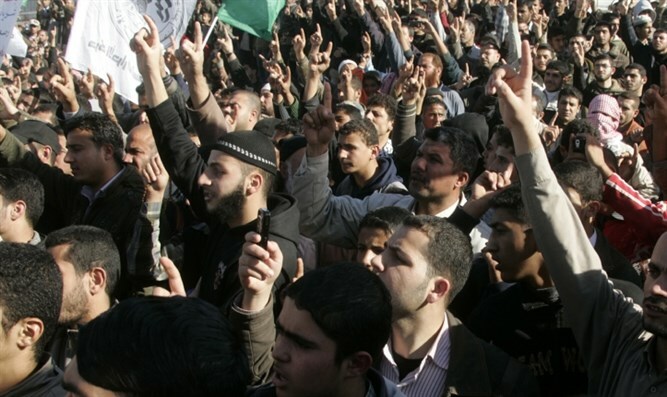 The National and Islamic Forces, the supreme coordinating body of the Palestinian Arab organizations, is calling on the Palestinian Arab public to hold mass rallies in a "day of rage" which will be marked on Friday after prayers in the mosques. The public was called upon to reach all points of friction in Judea, Samaria and Gaza in protest of the U.S. recognition of Jerusalem as the capital of Israel and its decision to move its embassy from Tel Aviv to Jerusalem. According to a statement published by the body, the “day of rage” is intended to convey a message to Israel that the "Palestinian people" would never forget the injustice done to them and would continue to act against the decisions on Jerusalem and the attempts to eliminate the Palestinian problem. A similar statement was issued by the Coalition of Intifada Youth, which called on the public to confront the "occupier" at the outskirts of the cities in Judea and Samaria.